← Physician Practice or Billing Company – What Coders Prefer Joining? 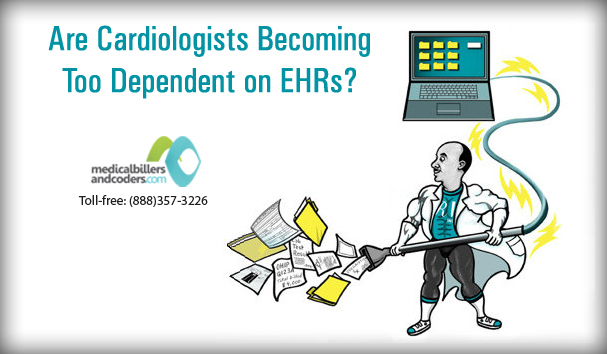 Are Cardiologists Becoming Too Dependent on EHRs? Electronic Health Records have created quite a stir in the medical field. Its introduction has made life easier for the medical fraternity. Initially though, it was not widely accepted and physicians were a bit unsure of taking this new technology on board. But as time passed its acceptance increased and more and more physicians made their practices enabled with EHR. There are a lot of benefits of having an EHR in the practice as it not only captures all the medical information of the patient but also the other data. Moreover, it is easy to share this data across labs, hospitals, cities, states and even countries. So if a patient is moved elsewhere the medical as well as all other data pertaining to the patient can be transferred with ease. These EHRs are programmed to assist the physicians in their area of specialty. Similarly, cardiologists have EHRs which cater to their specialty. The last few years have been difficult on cardiologists as there have been Medicare reimbursement cuts due to some key diagnostic services like echocardiograms. Add to that the impending implementation of ICD–10 which will restructure the coding, and increasing costs have made private practice a difficult option for cardiologists. In addition to this the administrative duties render lives more difficult for cardiologists. The documentation and billing requirement for Cardiology is quite demanding and due to its complex nature cardiologists have to spend an average of 15+ hours a week on administrative activities. However, with the correct IT solution these challenges can be mitigated. With the usage of EHRs, cardiologists can manage their tasks better. It makes life simpler for them. They can keep a track of their medical activities as well as administrative tasks with equal élan. The above mentioned points are just a few mentioned to give an idea the role EHRs play. There are several more aspects that are covered. Cardiologists should make sure that they do not get too dependent on the software. Eventually, it is them who will be treating the patient and not the software. It is a fact that EHRs are machines that help the workflow; not impede it. However, it is equally true that cardiologists are not too dependent on EHRs since they are aware of their profession being extremely complex to rely on only EHRs. Their use of the software is judicious, such that it assists them in carrying out their duties. This entry was posted in Cardiology Billing, EMR / EHR / Health IT, Practice Management. Bookmark the permalink.